When veteran astronaut Scott Kelly was selected for NASA’s first year-long mission in orbit, he opted to read the book Endurance: Shackleton’s Incredible Voyage by Alfred Lansing. The book reminded the Navy test pilot that his was not the most difficult mission of exploration undertaken nor was he in as dire straits as Ernest Shackleton’s harrowing voyage to Antarctica. 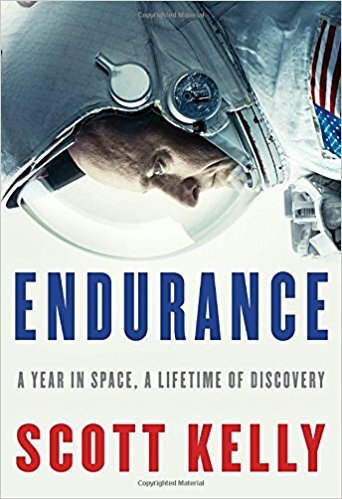 But Kelly also decided to write about his own time in space and took the name of his book, Endurance: A Year in Space from Lansing’s book. Kelly alternates between his time in space alongside cosmonaut Misha Korniyenko in an endurance mission intended to prepare for a mission to Mars and his life up to just before he and Korniuyenko left for Baikonour to launch. The mission reveals the long-term physical, emotional, and personal effects of prolonged time in space. By having a twin brother, Mark, in the space program, NASA had the added bonus of a genetically identical control specimen to compare as Kelly remained on the ISS. But Kelly also talks about his childhood, he and Mark the sons of two New Jersey police officers, of his being a subpar student in high school and his first year in college, and how the book The Right Stuff changed his life. He enrolled in a merchant marine school, joined the Navy, became a test pilot, and found himself accepted into NASA as an astronaut candidate. The space station is often this vague, cramped thing people float around inside on television. It makes the flights of the early Gemini, Voskhod, and Apollo missions seem distant and unreal, not changed by the space shuttles, Mir, and the ISS in the public imagination. An SNL skit with Tim Meadows and Chris Farley as flight controllers had Houston teasing the ISS crew while bored astronauts tried to make low-Earth orbit sound exciting. But Kelly paints a different picture. The ISS is a living space for up to nine people offering the most spectacular view of the world while cutting its crews off from it. Astronauts and cosmonauts now email and make phone calls from orbit, and they have to arrange how to pay bills and deal with mundane life matters. Days might be taken up with groundbreaking science and arduous engineering tasks (Take Kelly’s word for it. You really don’t want to do a space walk. Alexei Leonov and Ed White were the last space farers to enjoy the process. ), it’s also filled with fixing balky zero-G toilets, keeping a not-quite-improved CO2 filtering system running, and watching food fly all over the place with weightlessness. It’s both lonely and fulfilling, but sometimes hard personally. Kelly’s sister-in-law, former Congresswoman Gabriella Giffords, was shot while Kelly was on an early long-term mission. Sometimes, the personal does interrupt the progress of science. ﻿ Another thing, which Kelly had to lecture a Congressman about from orbit, is that politics really does not exist in space. One of his crewmates during his year in orbit was a cosmonaut who waxed nostalgic about the old Soviet Union. Not the Cold War. He just missed the old days. But Kelly and his American colleagues saw only cultural differences between themselves and the Russians who live on the opposite side of the ship. Those differences led to far more improvements in how each space agency runs their missions than any diplomatic or military disputes ever could. They’re all space travelers. Endurance: A Year in Space makes space travel real in a way only someone who’s lived in space can do. And only Kelly and his fellow astronauts and cosmonauts truly understand how the human race is benefiting from it all.